"The Continuing Evolution of Moore's Law" blog written by Dr. Michael Mayberry, the chief technology officer of Intel Corporation, was posted on August 2nd on EE Times website. He wrote that in the future the logic will move more toward 3D. A technology that could bridge the processor memory gap, Monolithic 3D has DARPA's attention. The agency wants proposals by Nov 6. Learn more at an upcoming IEEE conference. On Sept 13 the Defense Advanced Research Projects Agency (DARPA) launched a giant funding effort to ensure the United States will sustain the pace of electronic innovation vital to both a flourishing economy and a secure military. Under the banner of the Electronics Resurgence Initiative (ERI), some $500-$800 million will be invested in post-Moore’s law technologies. The main source of the gap is the limited number of long wires connecting memory to processor. This is driven by the fact that typically the process line for memory is very different than of processor, resulting in memory chips aggregated to memory modules and being connected to the processor using printed circuit board or, at best, carrier substrate. A technology that could bridge this gap — Monolithic 3D — has the potential to provide more than 1,000x better computers. DARPA kept the target enhancement to only 50x to allow use of chip manufactured in domestic older fab (~90nm) instead of off-shore 7nm fab lines. Proposals are due by Nov 6, allowing everyone a unique opportunity to hear an invited talk about the program on October 16 from the 3DSoC DARPA Program Manager, Dr. Linton Salmon during this year’s IEEE S3S 2017 at the Hyatt Regency at the San Francisco Airport. The IEEE S3S conference is dedicated to monolithic 3D technologies. It provides unparalleled opportunity for quick catch up with the broad spectrum of monolithic technologies. At the conference’s start Al Fazio, Intel Senior Fellow, will deliver a plenary talk on how 3D NAND and 3D XPoint ended being the trailblazing monolithic 3D IC technologies that have matured to volume production, taking over the fast growing memory market. The first day will conclude with two 3D IC focus sessions comprised of a mix of invited and submitted papers covering exotic technologies and the use of the emerging nano-wire transistors for 3D scaling. The first half of the second day includes a collaborative event organized by Qualcomm and CEA Leti — the COOLCUBE/3DVLSI Open Workshop. The second half includes an open 3D tutorial providing full coverage of the various 3D integration technologies from TSV to Sequential Integrations. The third day is made of four sessions of invited and submitted talks on monolithic and other forms of 3D integration. These sessions include a talk by MonolithIC 3D Inc. in which we will present a monolithic 3D technology that is ready to be rapidly deployed using the current transistor process. We will also describe how such an integration technology could be used to improve performance, reduce power and cost of most computer systems, suggestive of a 1,000x total system benefit. In addition, the IEEE S3S conference includes full coverage of SOI and low-power technologies, making it the place to be and to learn about alternative technologies to dimensional scaling. I am looking forward to seeing you at the S3S from October 16th thru 19th, 2017. ​ Learn all about Monolithic 3D at IEEE S3S. In perfect timing, this year’s IEEE S3S 2017 at the Hyatt Regency at the San Francisco Airport will feature a comprehensive show case for monolithic 3D IC technologies. At the start Al Fazio, Intel Senior Fellow, will give a plenary talk on how 3D NAND and 3D XPoint™ happened to be the trailblazing monolithic 3D IC technologies that have matured to volume production, taking over the fast growing memory market. The first day will end with two 3D IC focus sessions comprised of a mix of invited and submitted papers covering exotic technologies and the use of the emerging nano-wire transistor for 3D scaling. The first half of the second day includes a collaborative event organized by Qualcomm and CEA Leti – the COOLCUBE/3DVLSI Open Workshop. The second half will include an open 3D tutorial providing full coverage of the various 3D integration technologies from TSV to Sequential Integrations. The third day of the conference will include a full day with four sessions of invited and submitted talks on monolithic and other forms of 3D integration. These sessions will include a talk by us, MonolithIC 3D Inc., in which we will present a monolithic 3D technology that is ready to be rapidly deployed using the current transistor process. In that talk we will also describe how such an integration technology could be used to improve performance, reduce power and cost of most computer systems, suggestive of a 1,000x total system benefit. In addition, the IEEE S3S conference will have full coverage of SOI and low power technologies, making it the place to be and to learn about alternative technologies to dimensional scaling. I am looking forward to seeing you at the S3S from October 16th thru 19th, 2017. 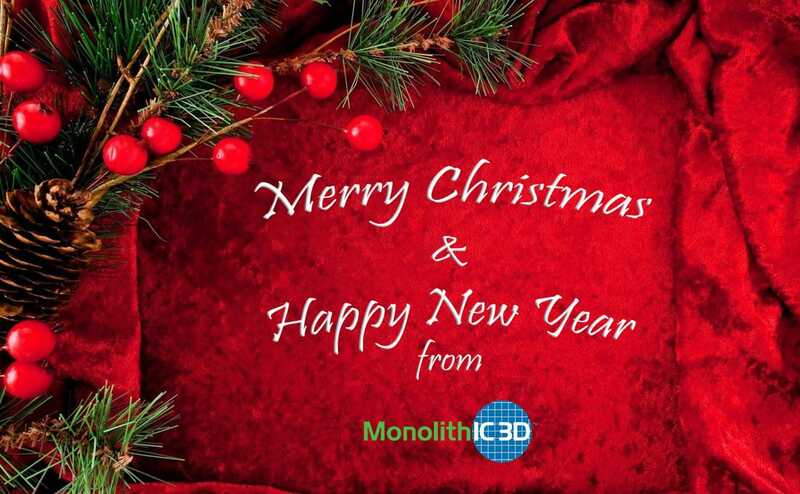 As we come to the end of 2016, MonolithIC 3D Inc. team would like to share its holiday greetings by wishing you Merry Christmas and a Happy New Year. We end this year with a grate recognition by Solid State's Magazine. Our CEO's recent blog post Moore’s Law did indeed stop at 28nm was number 1 of 2016 top stories. You can access the entire article here. As we have predicted two and a half years back, the industry is bifurcating, and just a few products pursue scaling to 7nm while the majority of designs stay on 28nm or older nodes. Our march 2014 blog Moore’s Law has stopped at 28nm! has recently been re-confirmed. At the time we wrote: “From this point on we will still be able to double the amount of transistors in a single device but not at lower cost. And, for most applications, the cost will actually go up.” This reconfirmation can be found in the following IBS cost analysis table slide, presented at the early Sept FD-SOI event in Shanghai. ​Gate costs continue to rise each generation for FinFETs, IBS predicts. As reported by EE Times - Chip Process War Heats Up, and quoting Handel Jones of IBS “28nm node is likely to be the biggest process of all through 2025”. IBS prediction was seconded by “Samsung executive showed a foil saying it believes 28nm will have the lowest cost per transistor of any node.” The following chart was presented by Samsung at the recent Semicon West (2016). ​And even Intel has given up on its “every two years” but still claims it can keep reducing transistor cost. Yet Intel’s underwhelming successes as a foundry suggests otherwise. We have discussed it in a blog titled Intel -- The Litmus Test, and it was essentially repeated by SemiWiki’s Apple will NEVER use Intel Custom Foundry! This discussion seems academic now, as the actual engineering costs of devices in advanced nodes have shown themselves to be too expensive for much of the industry. Consequently, and as predicted, the industry is bifurcating, with a few products pursuing scaling to 7nm while the majority of designs use 28nm or older nodes. Yes, the 50-year march of Moore’s’ Law has ended, and the industry is now facing a new reality. This is good news for innovation, as a diversity of choices helps support new ideas and new technologies such as 3D NAND, FDSOI, MEMS and others. These technologies will enable new markets and products such as the emerging market of IoT. A good opportunity to learn more about these new scaling technologies is the IEEE S3S ’16, to be held in the Hyatt Regency San Francisco Airport, October 10th thru 13th, 2016. It starts with 3D and FDSOI tutorials, the emerging technologies for the IC future. CEA Leti is scheduled to give an update on their CoolCube program, Qualcomm will present some of their work on monolithic 3D, and three leading researchers from an imec, MIT, and Korea university collaboration will present their work on advanced monolithic 3D integration technologies. Many other authors will discuss their work on monolithic 3DIC and its ecosystem, in addition to tracks focused on SOI, sub-VT and dedicated sessions on IoT. The industry is at a crossroads: some designs pursue scaling to 7nm while the majority stay on 28nm or older nodes. As we have predicted more than two years back, the industry is bifurcating, and just a few products pursue scaling to 7nm while the majority of designs stay on 28nm or older nodes. Our 2014 blog 28nm — The Last Node of Moore's Law has now been confirmed. At the time we wrote: “After the 28nm node, we can continue to make transistors smaller, but not cheaper.” It is illustrated in the following slide, presented by Samsung at the recent Semicon West 2016. This discussion seems academic now, as the actual engineering costs of devices in advanced nodes have shown themselves to be too expensive for much of the industry. Consequently, and as predicted, the industry is bifurcating, and few products pursue scaling to 7nm while the majority of designs use 28nm or older nodes. This is good news for innovation, as a diversity of choices helps support new ideas and new technologies such as 3D NAND, FDSOI, MEMS and others. These technologies will enable new products for the emerging market of IoT. A good conference to learn more about these new scaling technologies is the IEEE S3S ’16, held in the Hyatt Regency San Francisco Airport, October 10th thru 13th, 2016. CEA Leti is scheduled to give an update on their CoolCube program, Qualcomm will present some of their work on monolithic 3D, and three leading researchers from imec, MIT, and Korea universities collaboration will present their work on advanced monolithic 3D integration technologies, and many other authors will discuss their work on monolithic 3DIC and its ecosystem, in addition to tracks focused on SOI, sub-VT and dedicated sessions on IoT.